Trail Braking – The Key To Speed? Speed Secret: Overlap your braking, cornering and acceleration forces. Last year I was a guest instructor at a car club event the day after I had conducted a seminar for their members. Throughout the day, I rode in the right seat with half a dozen drivers of varying levels of experience and expertise. But there was one common piece of advice I gave them: overlap your braking and cornering, and then your cornering and acceleration. At many car club events I find myself in the discussion (argument?) about whether to teach trail braking, and if so, when. While I won’t get into the full details of my opinion here, my approach to teaching novice and intermediate drivers is to have them simply focus on releasing the brake pedal slowly and smoothly. That’s it. There’s no need to get into the minute technical details of why and what to call it – just release the brakes slowly and smoothly. In doing so, of course, the driver is beginning to learn to trail brake, to overlap the braking and cornering. There’s nothing like keeping it simple. And building good, solid habits from the very beginning. 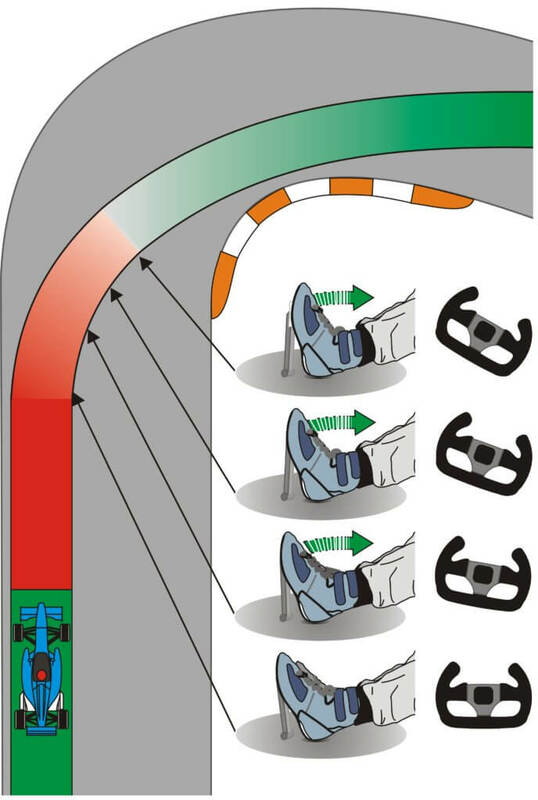 George – After beginning braking and before turn-in (always downshift before turning in – completely, with your foot off the clutch pedal before turning the steering wheel).